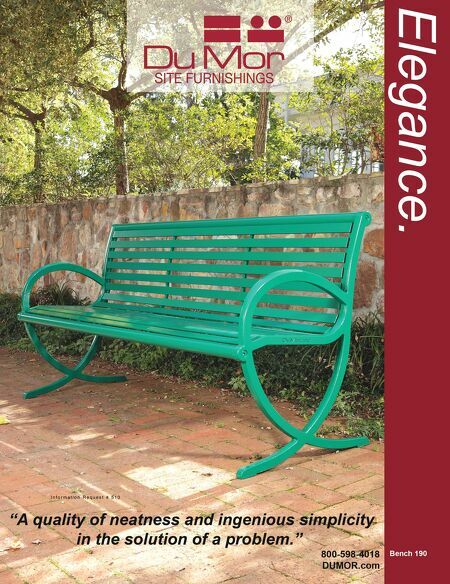 148 Landscape Architect and Specifier News 2016 Specifier's Guide site amenities Information Request # 9138 Authentic Provence Authentic French Versailles Planter Boxes in custom colors; French Planters in exceptionally large sizes; Copper; Aluminum and Lead Planters; Garden Antiques; Antique Limestone Fountains; Fountain Spouts; Antique Flooring; Garden Ornaments. 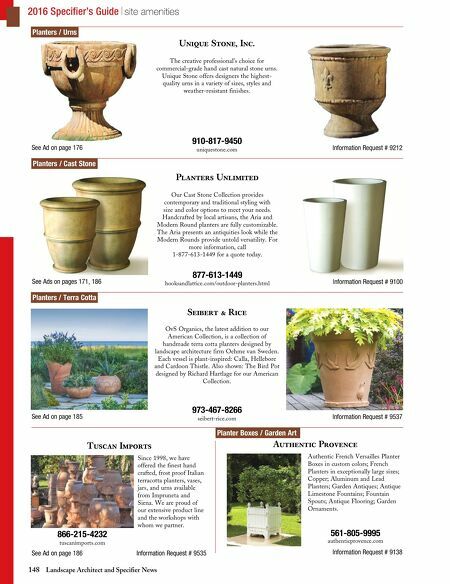 561-805-9995 authenticprovence.com Planter Boxes / Garden Art Planters / Cast Stone Planters / Terra Cotta Planters / Urns Tuscan Imports See Ad on page 186 Information Request # 9535 Since 1998, we have offered the finest hand crafted, frost proof Italian terracotta planters, vases, jars, and urns available from Impruneta and Siena. We are proud of our extensive product line and the workshops with whom we partner. 866-215-4232 tuscanimports.com See Ads on pages 171, 186 Information Request # 9100 Planters Unlimited 877-613-1449 hooksandlattice.com/outdoor-planters.html Our Cast Stone Collection provides contemporary and traditional styling with size and color options to meet your needs. Handcrafted by local artisans, the Aria and Modern Round planters are fully customizable. The Aria presents an antiquities look while the Modern Rounds provide untold versatility. For more information, call 1-877-613-1449 for a quote today. See Ad on page 185 Information Request # 9537 Seibert & Rice 973-467-8266 seibert-rice.com OvS Organics, the latest addition to our American Collection, is a collection of handmade terra cotta planters designed by landscape architecture firm Oehme van Sweden. Each vessel is plant-inspired: Calla, Hellebore and Cardoon Thistle. Also shown: The Bird Pot designed by Richard Hartlage for our American Collection. See Ad on page 176 Information Request # 9212 Unique Stone, Inc. 910-817-9450 uniquestone.com The creative professional's choice for commercial-grade hand cast natural stone urns. Unique Stone offers designers the highest- quality urns in a variety of sizes, styles and weather-resistant finishes.